If you’re a fan of tomatoes, you’ve probably cooked with crushed tomatoes a time or twenty. Likely, unless you’re an old school cook who makes everything from scratch and were brought up that way, those crushed tomatoes were probably purchased at the store and came in a can. We’ve all been there. We’ve used store-bought crushed tomatoes too…and they are great. 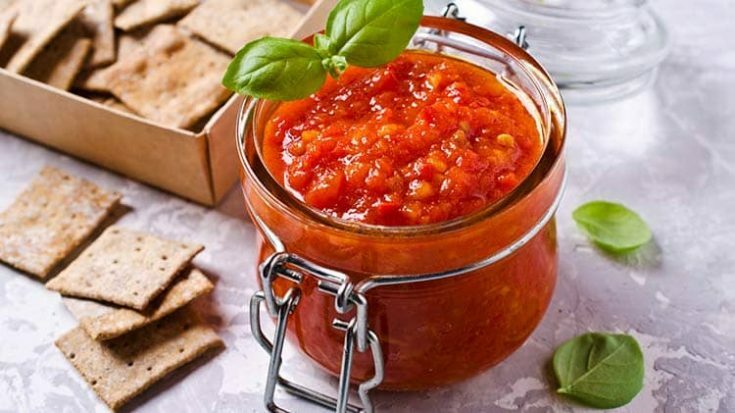 The thing about canning your own tomatoes, whether you’re putting up Whole Canned Tomatoes at home, enjoying some fresh Pico Sauce, or taking a turn at canning Crushed Tomatoes, is–they are the freshest canned tomatoes you’ll ever taste. When you can your own produce–or put it up in the freezer for that matter–you’re taking a few steps out of the ordinary produce to store approach. In fact, you’re picking vegetables fresh and preserving them right away. On the other hand, if you were to buy canned tomatoes at a store, many of those tomatoes are picked before they have reached their peak flavor and ripeness–which results in a less flavorful tomato sauce. Crushed Tomatoes are easy to make, and follow a simple set of instructions. Wash the tomatoes then dip in boiling water 30 to 60 seconds. Immediately dip in cold water. Slip off skins. Trim away any green areas and cut out core. Cut the tomatoes until they measure about 2 cups. Transfer to a large stainless steel saucepan and bring to a boil over medium-high heat. Use a potato masher to help crush tomatoes and release the juices. Stir often and add more tomatoes being careful to avoid scorching. The remaining tomatoes do not need to be crushed, as they will soften with heating and stirring. Continue until all tomatoes are added, then boil gently for 5 minutes. Add 2 Tbsp of lemon juice to each quart jar and then add the hot tomatoes into jars leaving a 1/2 inch to the top of the jar. Compress the tomatoes into the jar until the spaces between them fill with juice, leaving 1/2 inch headspace. Wipe rim and add the lid adjusting the band until finger tight. Don’t overtighten. Process filled jars in a boiling water canner for 45 minutes. Remove jars and cool. Check lids for seal after 24 hours. Lid should not flex up and down when center is pressed. Makes about 1 quart. I’m totally fascinated with this recipe, Adriana! Tomatoes are a must in my home and kitchen! I’m gonna try it and let you know!